Raith Rovers promoted to the premiership! Huge congrats on a very successful season for Raith, they will be promoted as champions should they beat Forfar next week or Dumbarton fail to beat Arbroath. 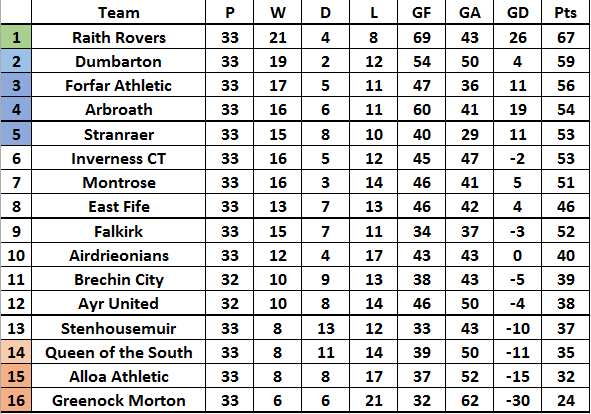 Falkirk finish in 9th, a solid finish for a team that was lingering around the bottom 4 for the majority of the season. Stranraer leap frog ICT into the last play-off position, both teams play each other again this weekend in Inverness. QoS miss the chance to leapfrog Stenhousemuir with a loss to already relegated Morton. Rangers open up a 9 point lead, looking increasingly unlikely that they'll be stopped now. 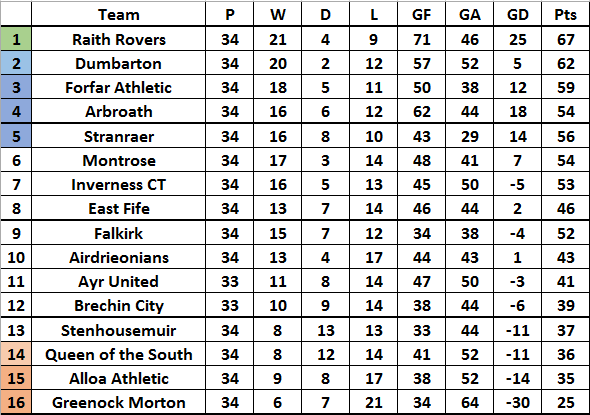 Ross County & Kilmarnock strengthen their grip on the 2 EL play-off spots. 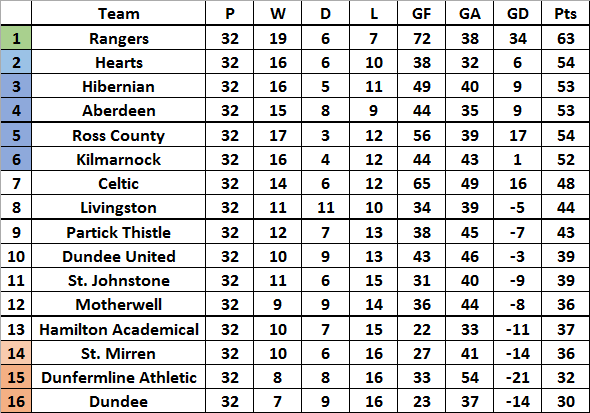 Dundee & Dunfermline now plunge further into relegation trouble with defeats to Hamilton & St. Mirren, Dundee & Dunfermline double headers in W33 & W34, with the overall loser of those matches surely down, Hamilton & St. Mirren double header as well, with the overall winner surely safe. Forfar & Dumbarton trading blow for blow for the final automatic promotion place. Forfar host Arbroath next week while Dumbarton travel to Kirkcaldy to face Raith. Dumbarton v Forfar on final day of the season, could be a very nervy finish to the season. Stranraer leap frog Inverness following back to back wins against them, they now consolidate the final play-off spot. 3 wins and a draw from the split fixtures have seen Alloa in with a real shout of avoiding the drop, not least their 1-0 victory over 13th placed Stenhousemuir this weekend, they travel to already relegated Morton next week knowing that anything other than a victory could see them relegated. First time I have seen this. Pretty wild!